Welcome to this year's 45th issue of DistroWatch Weekly! DistroWatch Weekly was first published in June 2003 as a publication summarising the happenings in the distribution world on a weekly basis. Now, 5½ years and 278 issues later, an era is about to end. The publication that has been growing in stature and influence, needs a new editor, a person (or two) with fresh ideas, eager for new challenges, ready to report about the latest technologies in an unbiased manner. If you think you can fulfil the criteria, please read below for the official "position vacant" notice. In the meantime, please accept our apologies for missing an issue last week. We hope to bring you more quality articles, authoritative news summaries, and all the usual goodies you've come to expect from your DistroWatch Weekly in the future. Happy reading and thank you all for your continued support! I published the very first issue of DistroWatch Weekly (DWW) on 9 June 2003. The introductory instalment was followed a week later with a somewhat "beefier" one, covering JAMD Linux, a distribution that was gathering some momentum in those days. Like many other one-man projects throughout the history of Linux distro development, JAMD disappeared a few months later without a word of explanation or any sort of apology. But these were the kinds of topics that DWW was hoping to bring to the attention of the readers: presenting a new, interesting distribution, giving space to distro developers to explain their work, evaluating the growing number of products vying for our attention, and providing opinions on the current issues. In other words, it meant to serve as a discussion forum on an otherwise facts-only news and reference portal. For over 5½ years I've never involuntarily missed a single issue - until last week, that is. That was when I found myself confined to bed, for a second weekend in a row, with some nasty infection that made it impossible for me to even look at a computer screen, let alone write articles that tens of thousands of visitors would want to read. As a result, I decided to cancel last week's issue and get myself plenty of rest instead. In the days that followed, I also decided to resign from the position of the editor of DistroWatch Weekly. And yet, I think that DWW should continue. Without it, DistroWatch is just another soulless database, not unlike Freshmeat - useful for sure, but hardly an exciting place to visit. Besides, wouldn't you miss all those good, spicy forum fights we've had the pleasure and misfortune to witness over the years? So here it comes - the official position vacant notice. DistroWatch is looking for a new editor of DistroWatch Weekly. A successful applicant would be someone with knowledge of (and enthusiasm for) Linux, BSD, OpenSolaris and open source software in general, with good writing skills. The duties will be simple - to compile and publish a new issue of DistroWatch Weekly every Monday, complete with a lead story, a news summary, and all the regular columns. For this work I am prepared to offer US$150 per issue (I hope to bring this up to US$200 per issue once the current economic slump is over and online advertising picks up again, but it looks like it may still take a while). Interested applicants should email their applications with links to their articles, blogs, etc. (if available) to distro at distrowatch dot com. Finally, I wish to express my gratitude to everybody who has contributed to the success of DistroWatch Weekly over the years. I don't intend to disappear from public life completely, but for the foreseeable future I'd like to go through my long and growing to-do list to improve the site and to implement some of the often-requested features. Of course, you can still count on me bringing you the latest release news and to keep all distribution pages up-to-date. With luck, we could have a new DistroWatch Weekly, written by a new editor, next Monday, but a lot depends on how fast we can find the right person(s) for the job. In the meantime, have a nice week and thank you all for your continued support! Sun Microsystems has announced the availability of an update build of Solaris 10, release 10/08: "Sun announced the latest version of the Solaris 10 operating system - Solaris 10 10/08. The new version builds on the core strengths of the Solaris 10 to help customers maximize asset usage and systems performance, manage datacenter complexity, preserve business continuity and reduce costs. Solaris 10 10/08 includes numerous product updates and enhancements, several of which were done through the OpenSolaris community. New features in Solaris 10 10/08: the ZFS file system has been enhanced with recent work from the OpenSolaris community; Solaris 10's virtualization technologies, such as Solaris Containers, have been enhanced with new features; Sun and Intel continue to collaborate to help ensure Solaris 10 will support Intel's latest Intel Xeon processor line." Read the release announcement and press release for further details. 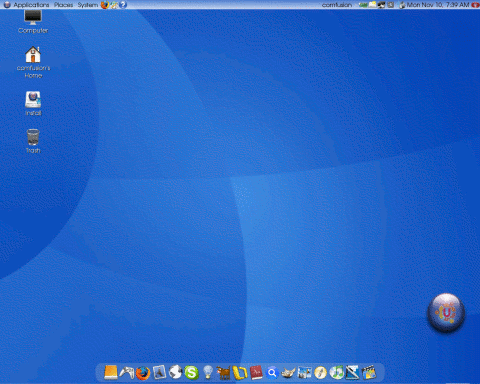 ComFusion is an Ubuntu-based live DVD featuring out-of-the-box support for a variety of Compiz Fusion effects and a Mac OS X-like user interface. The latest version, 2.0, was announced today. Built from Ubuntu 8.04, ComFusion 2.0 brings a choice of two desktop environments - GNOME 2.22.1 (default) and Xfce 4.4.2, both with complete support for Compiz effects and with a Mac OS X-style Wbar for quick access to popular applications. Other features include enhanced support for wireless network cards, a variety of Compiz Fusion utilities and scripts for downloading restricted media codecs, inclusion of several Google Applications, Skype and other non-free software, a collection of games, office and development software, support for English, German, Italian, Portuguese and Spanish languages. For more information please read the release notes (in Spanish) which provides a detailed list of included applications and other features. Fabio Erculiani has announced the release of Sabayon Linux 3.5.1: "Sabayon Linux has released an update for the 3.5 branch. The primary focus of this release is to provide a version that is current with the Entropy repository for the 3.5 branch. This will alleviate the updating that is currently necessary after installing Sabayon Linux 3.5. Since this is primarily a maintenance release, Sabayon Linux recommends that users who already have an installed version of Sabayon Linux 3.5 wait for the release of Sabayon Linux 4.0 to update their installations. Distribution features: Linux kernel 2.6.26 with extended wireless, laptop (UMPC, like Eee PC), file system (Unionfs, Aufs, Squashfs, ext4, NTFS-3G) support; out-of-the-box hardware detection, input devices, GPUs, wireless; outstanding easy-to-setup 3D desktop, gaming support, thanks to Compiz Fusion 0.7.8 and a set of free top-tier games included or available; X.Org server 1.4.2 (7.3), KDE 3.5.10, GNOME 2.22.3, Entropy 0.23.8." Read the rest of the release announcement for more details. An updated release of SystemRescueCd, version 1.1.1, is out: From the changelog: "Updated the standard kernels to Linux 2.6.26.7 with Reiser4; updated the alternative kernels to Linux 2.6.26.7 with Reiser4; updated the speakup kernel modules; updated TrueCrypt (encryption program) to 6.0a; updated NTFS-3G to 1.5012 (NTFS full read-write support); updated GParted to 0.3.9; updated the e1000 network driver (with protection against corruption); updated 'Offline NT Password & Registry Editor' ('ntpasswd' boot entry); fixed option 'skipmount' which was broken; the network driver r8169 is back in the standard kernels; added support for Firewire 1394 which was missing from the kernel; added ntfsreloc 0.7 (deals with moving NTFS file systems); added network drivers: atl1e, at76_usb; added firmware for Ralink rt73-based WiFi USB adapters." 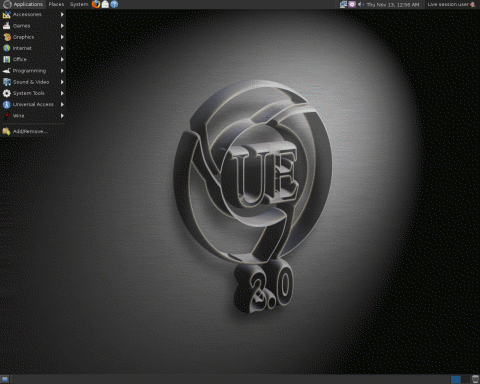 Glenn Cady has announced the release of Ultimate Edition 2.0, a desktop distribution and live DVD based on the recently released Ubuntu 8.10: "Ultimate Edition 2.0 has been released. Ultimate Edition 2.0 is built based on Ubuntu Intrepid Ibex, it is loaded to the hilt with themes, wallpapers, icon sets, GDM login screens, and usplashes. If you have a 64-bit processor I highly recommend the 64-bit edition. This release has all the goodies you have come to love with previous editions pre-added and a few new ones. It has a newer kernel and all updated as of release date pre-installed for your convenience. Compiz Fusion works right off the live DVD without drivers." Read the full release announcement for further details. Steven Shiau has announced the release of Clonezilla Live 1.2.1-17, a Debian-based live CD designed for hard disk cloning and partitioning tasks: "Clonezilla live 1.2.1-17 (stable) released. This release is based on Debian 'Lenny' with Linux kernel 2.6.26. Changes: a simplified Chinese interface was added; an option to reboot or shutdown after clone is finished was added; hardware and software information is saved in a Clonezilla image; an option to generate MD5 or SHA1 checksums after an image is saved was added; running on serial console ttyS0 is supported; some more information will be saved in image directory; when restoring an image, image name and target device are chosen first, then advanced parameters; a new option '-z1p' was added to support parallel gzip program (pigz) to compress image for SMP machines; machine product name is shown before restoring image...." Read the release announcement and release notes for more details. BlankOn Linux is a distribution created in cooperation between the Indonesian Linux User Group and the Indonesian Ubuntu community. Its primary goal is to deliver a desktop-oriented Linux distribution with full support for the Indonesian language. The latest version, 4.0 "Meuligoe", is based on the recently released Ubuntu 8.10, with Linux kernel 2.6.27 and GNOME desktop 2.24. Some of the features incorporated in the release include: popular GNOME applications, such as The GIMP, Inkscape and GnuCash are included in the default install; out-of-the-box support for MP3 and other widely-used media codecs, as well as encrypted DVDs; custom theme and artwork. The release is available in three formats: as an installable live CD, as an installation CD, and as a minimal live CD (with AbiWord and Gnumeric replacing OpenOffice.org and Epiphany replacing Firefox). Please read the release announcement and release notes (both links in Indonesian) for further information. Jesse Keating has published some thoughts on the next release of Fedora, version 11. Due to delays in delivering Fedora 10 and in considerations for the upcoming release of Red Hat Enterprise Linux 6 (which will be based on Fedora 10/11), there will be a slight departure from the usual early May release: "We're mostly interested in the end date of Tuesday May 26th. The intra-schedule dates are given mostly for reference, and we'll still need to spend some time vetting them against trade shows, holidays, etc. We'll also be filling in all the other details that you typically see in a Fedora schedule, once we reach an agreed upon strategy for F11/F12." For more information please see the Fedora 11 proposed release schedule here. ExTIX. ExTIX is a desktop Linux distribution based on paldo GNU/Linux. Like its parent, ExTIX uses a powerful hybrid (source and binary) package management tool called Upkg. The distribution comes as a live DVD and includes a graphical system installer. CAINE. CAINE (Computer Aided INvestigative Environment) is an Ubuntu-based GNU/Linux live distribution created by Giancarlo Giustini as a project of Digital Forensics for Interdepartmental Centre for Research on Security (CRIS), supported by the University of Modena and Reggio Emilia. The CAINE forensic framework contains a collection of tools wrapped up into a user friendly environment. Furthermore, it introduces novel features - it aims to fill the interoperability gap across different forensic tools, it provides a homogeneous GUI that guides digital investigators during the acquisition and analysis of electronic evidence, and it offers a semi-automatic process for the documentation and report compilation. Canaima. Canaima is a Venezuelan Linux distribution based on Debian GNU/Linux. It is designed as a solution for the computers of National Public Administration in accordance with the presidential decree number 3.390 about the use of free technologies in the National Public Administration in Venezuela. The project's web site is in Spanish. Progex. 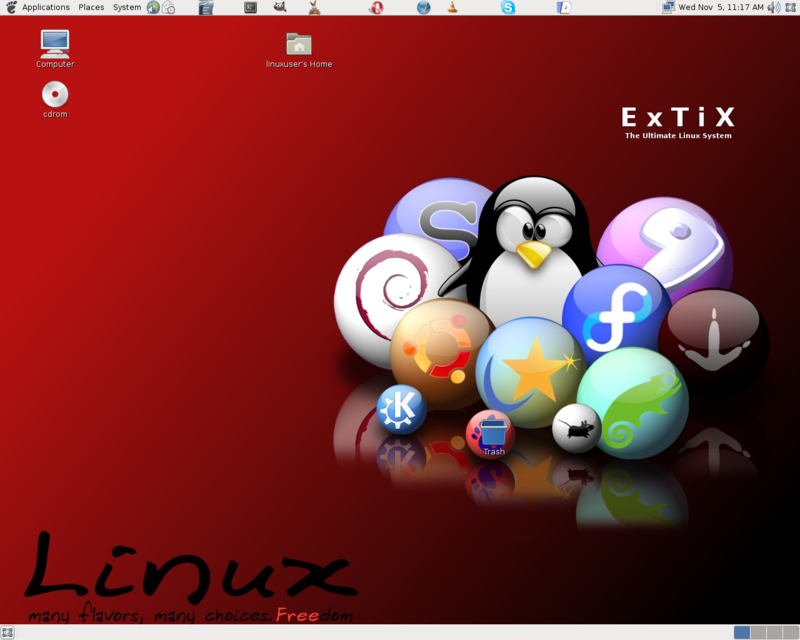 Progex is a new Ubuntu-based distribution and live DVD. It includes a large collection of programs that were manually configured so that the user can do almost anything out-of-the-box (including audio and video editing) and without spending time configuring after installation. Progex was born so it can be the most complete distribution and to serve all kinds of end-users. RsLive. RsLive is a Debian-based live CD. Its main features are: BusyBox GUI; virus and spyware scanning; writeable access on NTFS file systems; memory test (Memtest86+); GParted; the CD is usable with a null modem cable (serial) only. The distribution's web site is in German. Suriyan Linux. Suriyan Linux is a distribution based on Kubuntu and targeted at Thai-speaking users. This project is focused on fixing Thai-related problems, including translations in Qt4/KDE4 and in Debian/Ubuntu GNU/Linux platform in general, and Thai localisations for KDE. All deliverables are sent to upstream sources, and are included in a KDE-based Linux live CD for Thai desktop users to try out Linux/FOSS with Thai support. The project's web site is in Thai. VortexBox. VortexBox is a complete CD ripping and media server solution based on Fedora. Once VortexBox has been loaded on an unused PC it will automatically rip CDs to FLAC and MP3 files, ID3 tag the files, and download the cover art. VortexBox will then serve the files to network media player such as Logitech Squeezebox. The file can also be streamed to a Windows or Mac OS X system. WeakNet Linux. WeakNet Linux is an Ubuntu-based live DVD containing a variety of security tools. It is designed primarily for penetration testing, forensic analysis and other security tasks. And this concludes the latest issue of DistroWatch Weekly. Underground Desktop was a GNU/Linux distribution targeted at the desktop user. It was based on Arch Linux. Its main features are ease of installation, kernel optimisation for modern processors (i686), and the KDE desktop.